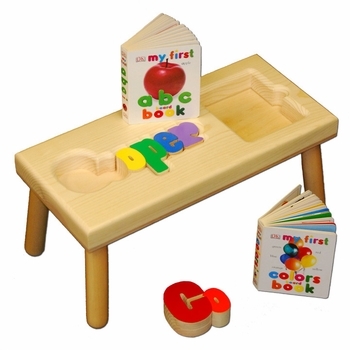 Building on the popularity of our personalized baby name seat, this version comes with baby�s first board book and a book storage compartment next to the baby name puzzle. A wonderful gift to welcome a newborn into the world and a great idea for a first birthday present, this puzzle seat facilitates dexterity and problem solving skills. Each seat is manufactured in America using furniture grade wood and finished with water-based, non-toxic paint. Measuring 9 by 20 inches, the seat comes in handy for many things like reaching the sink for washing hands and brushing teeth. Rush order option: Your order will be moved to the front of the production line and completed in only 4 to 5 business days. Manufacturing process on this product requires a longer period of time and is totally worth the wait!